Late Lady Blue Devil rallies nip Fort Scott in 10-9 thriller – Welcome to Wyandotte Daily! 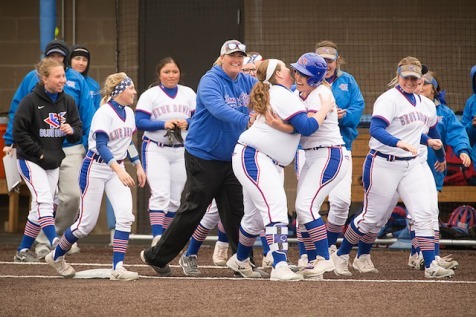 Kansas City Kansas Community College snatched victory from the jaws of defeat in the most exciting softball win of the season Tuesday. 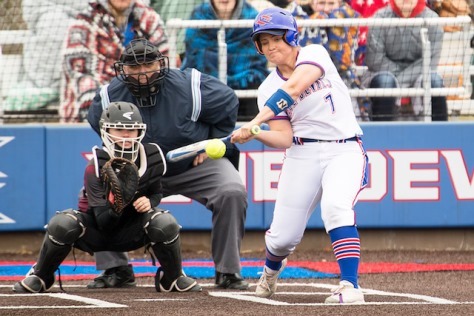 Trailing Fort Scott 9-5 with five outs to go, the Lady Blue Devils scored three runs in the bottom of the sixth inning and two more in the bottom of the seventh for their first Jayhawk Conference win 10-9. However, Fort Scott used a big seventh inning uprising for an 11-4 second game win. The Blue Devils are right back in action Thursday, as hosts of Maple Woods followed by Cloud County Tuesday. Both doubleheaders will start at 2 p.m.
KCKCC’s comeback in the opener came with one out in the sixth inning. After loading the bases on a single by Logan Tucker, walk and an error, Jennifer Mullins singled in one run and Kaylee Arnzen doubled in two more to cut the Fort Scott lead to 9-8. A pair of Basehor-Linwood grads, Natalie Cowan and Kali Jacobson, provided the big blows in the seventh. Cowan bunted for a single, stole second, took third on a wild pitch and scored the tying run as Tucker was being thrown out at first base. Jadyn Lindgren then drew a two-out walk and scored the game-winner of Jacobson’s one-hop triple to left-center. Lauren Scott provided KCKCC’s other big blow, a grand slam home run in the first inning after Fort Scott had taken a 4-0 lead. The grand slam was set up by an error and singles by Mullins and Brown. Scott also scored the Blue Devils’ fifth run when she singled to lead off the fifth, took second on a Cowan sacrifice bunt and scored on Tucker’s single. Scott finished with three hits and Brown, Mullins and Tucker two each in KCKCC’s 14-hit attack. The rally made a winner out of Shannon Greene, who gave up 12 hits and nine runs, seven of which were earned. Fort Scott scored four runs in the first on three doubles and then went ahead 6-4 in the second on a pair of unearned runs. The Greyhounds opened a 9-4 lead in the fourth, scoring three times on two doubles and two singles but it wasn’t enough to hold off the Blue Devils. The second game had all the makings for another come-from-behind-win. Trailing 5-3, the Blue Devils cut the deficit to 5-4 in the bottom of the sixth on a Cowan triple and Tucker sacrifice fly only to have Fort Scott score six runs on seven hits and two errors in the top of the seventh. Led by Shelby Choate’s four hits including a solo home run, the Greyhounds finished with 15 hits off four KCKCC pitchers. The Blue Devils finished with 10 hits including six for extra base hits. Cowan tripled and singled, Mullins doubled and singled and Brown, Lindgren, Arnzen and Scott each doubled.